The MCU's Captain Marvel has been a smash hit, and we're already excited to see how Carol Danvers and the surviving Avengers gang are going to stir up trouble for Thanos in Endgame. Coincidentally, the original Captain Marvel is getting a film of his own pretty soon. Only this time, he's a DC Extended Universe character, who, after a copyright legal saga, goes by his official new name: Shazam. Shazam historically hasn't attracted as much fanfare as Superman or Wonder Woman, but he's certainly one of the most indestructible heroes from DC Comics. 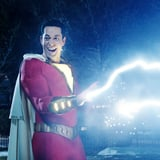 Before you watch Zachary Levi light up the big screen as this almighty character, here's what you need to know about Shazam's impressive arsenal of superpowers. Like many a superhero, Billy Batson, aka Shazam, starts out as a young orphan with a lot of misdirected angst. One day, he stumbles across an ancient wizard named Shazam, who chooses Billy to be the champion of humanity. The figure grants him a whole bunch of superpowers, which we'll get more into below. To transform from a normal boy into a brawny, nearly invincible hero, all Billy has to do is to shout "Shazam!" Shazam at first sounds like a cool and punchy marketing term, but it's actually an acronym for six powerful (mainly Greek) beings who grant Billy his abilities. Here's a quick run-through of what each letter stands for. S is for Solomon's wisdom. Shazam's powers of the mind include high intelligence, clairvoyance, and even the power to understand any language. H stands for Hercules's strength. This power is relatively self-explanatory. A is for Atlas's endurance. If you recall from the Greek mythology unit in world history class, the gods condemned Atlas to carry the entire globe for all eternity. Shazam has incredible durability in that he has no need for eating and sleeping. Z represents Zeus's power. Shazam can throw lightning bolts and undergo accelerated healing. M stands for Mercury's speed. Mercury is the Roman god of strength, which means that Shazam is very, very fast. Each power is impressive on its own, but together, they make Shazam a pretty undefeatable opponent. At one point in the comics, however, Shazam loses all of his powers when the DC villain Darkseid dies, but he eventually gets similar powers from new gods. Shazam's definitely one of the most formidable DCEU heroes. In the comics, he has successfully defeated mighty heroes and villains, including Superman, Spectre, and even The Flash. That's not to say that the hero hasn't had struggles. While Shazam, in transformation, doesn't have physical vulnerabilities, there are ways in which he can be stopped. Powerful magic conjured by beings such as Spectre can limit Shazam. Also, keep in mind that he's just a boy when he's not Shazam, so physically restraining him from shouting "Shazam!" keeps him as Billy Batson. We're excited to see how he'll wield his powers in Shazam!, which is already receiving high praise among critics!